In the day job, I’ve coined a newish word – decorporatization. My chart shows what I mean. It shows that in recent years we haven’t seen just a squeeze on wages, but also a squeeze on profits; the share of these in GDP has fallen recently. 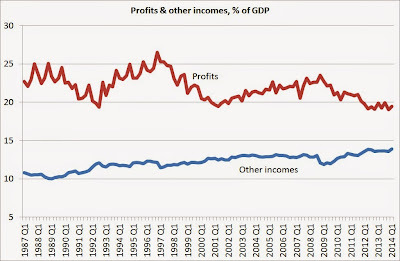 One reason for this is that the incomes of the self-employed – measured by the ONS as other incomes – have increased. This hasn’t happened because the self-employed are raking it in, but because there are so many more of them. This is what I mean by decorporatization; we’re seeing a shift from corporate sector activity to the self-employed. Some of this might be due to firms employing freelancers and one-man subcontractors rather than staff – perhaps because transactions costs have fallen. 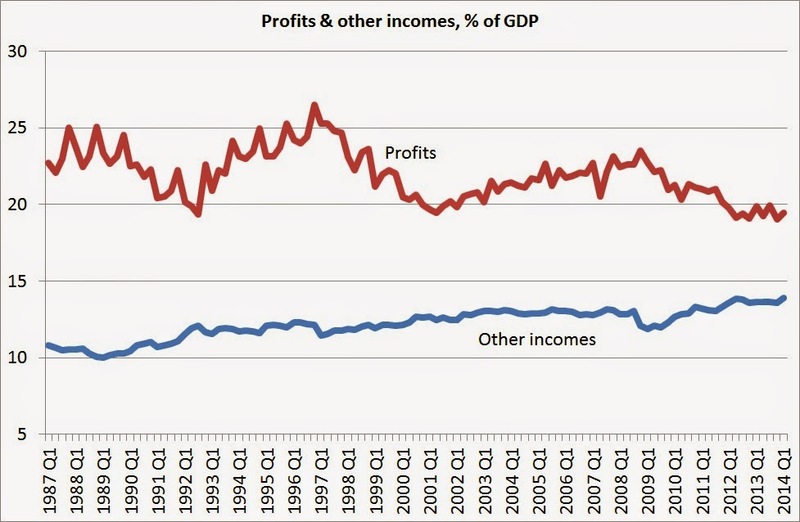 However, whilst this might have have increased profits for particular firms, it hasn’t increased them in aggregate. And this is possible. Likely I would say. But I would put forward another factor, the thing that New Zealand governments used to get very excited about, the knowledge economy. Remember the “knowledge wave” the last Labour government promised us but never seemed to deliver on. [h]uman capital is replacing inanimate assets as the most important source of corporate capabilities and value. In both their organizational structure and their promotion and compensation policies, large firms are becoming more like professional partnerships. It is also likely that this change has increased the number of sole-proprietorship and small partnerships being formed. The important point here is that if your firm is based, in the main, around human capital then it is much earlier and cheaper to set-up a firm than it is to set-up a nonhuman capital based firm. There is no need to find and negotiate with and keep happy external financiers who supply the funding required to purchase large amount of nonhuman capital. With a human capital based firm the human capital is much more likely to be able to provide any nonhuman capital required without the need of external funding. For example if you are a computer scientist using a PC to design small business accounting software, then your firm being a sole-proprietorship or a small partnership is feasible whereas if you are writing software for a super-computer you are more likely to be an employee of whoever owns/rents the computer. That is, in the first case human capital is the major input to the production process of the firm while in the second nonhuman capital plays a much greater role and this leads to different organisational forms. So what Chris is noting is an effect of a change in the importance of human capital to the production process, at least in some areas of the economy. More small firms are being set-up because it is cheaper to do so. Large amounts of expensive nonhuman capital are not necessary. Ross. That would require that the firm owns the employee’s capital. Since that would require the legalisation of slavery, I am hoping that it never happens. Seamus. Does it need slavery? Many sports teams are paid to transfer players so I guess those players are an asset for the club. Paul. That is true, but a) it is a fast depreciating asset (only the length of the contract) , and particularly with the value of the asset to the firm depreciating faster than the actual productive value of the asset, b) contracts that prevent you plying your trade with competitors are rare outside of sport (and possibly not legal in most cases), and c) even in sports, in some cases the asset depreciates much faster than the length of the contract due to code switching (ask the Bulldogs about their asset value from SBW). A person with a contract couldn’t possibly be an asset…..
For many professional sports teams the only assets they have are their players.